It may be a good time to add a new pair of comfy sweatpants to your Christmas list. Krispy Kreme’s popular “Day of the Dozens” deal is back today -- Wednesday, December 12 (12/12, get it?) -- which means you can snag an extra dozen donuts for just $1. More donuts, less money -- it doesn’t get much sweeter than that. 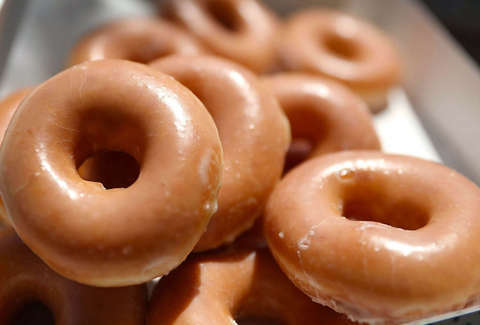 Here’s the deal: On this most holiest of days, Krispy Kreme customers can purchase a dozen of its iconic Original Glazed donuts and get a second dozen for just a buck. In other words, you’re getting two dozen donuts for just a little more than the price of one dozen. You don’t need a coupon, costume, hashtag, or catchphrase to cash in on this deal. You might need someone to share all the sugary dough with, but that's totally optional. Me: "I'll take a dozen, please." Dave Skena, chief marketing officer at Krispy Kreme, aptly described the promotion as "a sweet deal," per a company press release. The only downside? This deal is limited to two per customer. And be sure to call ahead to find out if your Krispy Kreme location is participating in this offer. If not, well, better luck next time. If glazed donuts aren’t your thing, your loss! Just kidding. Krispy Kreme’s “Day of the Dozen” may only extend to this sugary classic. Unlike the last time it offered this $1 dozen deal, Krispy Kreme isn’t rolling out a special donut to go with it.